Starting on December 1st, Universities that license Office Education for their faculty and staff can offer students Office 365 ProPlus for free thanks to a new program called Student Advantage. For students at these institutions, that means free access to Word, PowerPoint, Excel, OneNote, Outlook, Access, Publisher, and Lync. While many cheaper alternatives to Office 9 of the Best Free and Low-Cost Alternatives to Microsoft Office 9 of the Best Free and Low-Cost Alternatives to Microsoft Office Microsoft Office has dominated the market of text documents, spreadsheets and slide shows for years, and for good reason – it’s one of the very best. However, there’s one drawback and that is the price.... Read More have sprung up, many students still rely on Redmond’s good ol’ productivity tools. Office 365 University typically costs $80 for a 4-year subscription for students, which is already a heavy discount over the usual $99 per year subscription to Office 365 Home Premium. 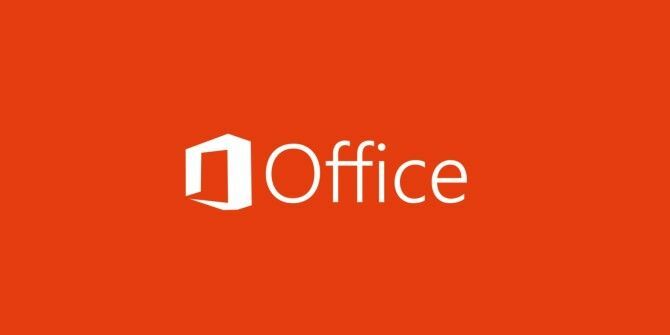 Microsoft has been moving from selling Office as a one-time deal to a subscription service through Office 365. Microsoft’s stated goal is to better prepare students for a workforce in which Office plays a very central role. In a study by Microsoft and the IDC, they found that proficiency in Microsoft Office was the third most sought after skill in high-paying jobs. Microsoft claims that 110 million staff, faculty, and students are already using Office 365 Education, spanning 119 countries and 36 languages. If enough Universities take advantage — excuse the pun — of Student Advantage, that number could greatly increase without costing the Universities or students anything extra. Over 35,000 institutions are already automatically eligible for Student Advantage. If you’re lucky enough to be enrolled in one of the eligible Universities, you should check out our Office 2013 guide to to be able to fully utilize the productivity suite. Do you think Office is still necessary or relevant for students? Will your University be rolling out this program for its students? Let us know in the comments. Explore more about: Microsoft Office 365, Study Tips. So helpful and informative. So rare to find someone who makes an explanation so simple and eay to understand - and provide a solution that works. One of the earlier posts states that MS does NOT have a list...that you need to inquire at your university if you want to know!!! does anyone have the link for the free microsoft office? And what about non public universities in Poland? How can I check if my school is on the Microsoft list? ^ There is a list of universities on Microsoft's site. It does include a majority of colleges from India, so check it out to see if yours is there on the list. Harish - Be kind enough to share the link to that list. If it was easily found then people would not be asking it. how do i know my university have this facilitie or not ??? This news comes out literally 1 day after I actually Purchased the University Edition. Dang it. Looks like my college is loading it all up on Dreamspark too. If it's only been one day, you may be able to get a refund by emailing/calling MS support? Worth a try, at least. Nah, I purchased the license through Amazon. Crazy story, I couldn't purchase through Microsoft because I am in Japan. I am attending a US College campus here, had no luck with Microsoft Support to Activate it at all and I had to use a TOR browser and access a US server to activate it properly with my education email. I don't even want to go through the trouble of getting a refund. But I did save 10 bucks by going through Amazon to get it. Not for me. Please arrange a give-away and your ratings will go up. MSFT will educates the students to use O365. Most of the curriculum will be saved in the cloud. Students will most likely stick with o365 after graduation. Strategic move for MSFT. Great for Universities and Students. Great, much better than the Office university. The trick they forget to mention is that after you graduate they will cut off your "University" license. I asked MS and that was the answer they gave. Schools will NOT likely be advertising this as a benefit, since it would take away profits from their book store. Will there be a list maintained by MS that students can look at? I was unable to find any list maintained by MS. It's likely that you'll have to inquire within your University. Does your University bookstore sell MS Office? Mine doesn't, so I don't think it would do anything to chip away at their profits. Regardless, I'm not sure how many Universities will really advertize this, probably due to a lack of communication between Microsoft, their IT departments, and their Student Relations office. How do I find out if my institution is already on it ? email/call your school's IT department. there's a good chance that they already license Office; for instance, can you use Office on the school library's computers? If the IT department won't help you out, I'd submit a Letter To The Editor of your school newspaper complaining about how Microsoft has this opportunity for students and your school isn't taking advantage of it. School newspapers can be a powerful tool for change. That's not "free," that's "already purchased by your institution." Really, it is a wrathful step by Microsoft in student's favor. It gives a better example for other I.T. companies to innovate new things for student's development. The only reason I believe students "rely on" Microsoft Office is because they are told they need to use it along with the rest of the books and supplies they are told to get for their classes. Could they get away just fine with Libre Office or other alternatives? Absolutely, unless the class is on MS Office products or requires Access for database work. But as nobody says "you need MS Office or equivalent", they don't realize they have a choice. Still, I would rather not be tied to MS anymore than I already am. So I use Kingsoft Office. It's free and it looks and behaves A LOT like modern MS Office. Well, if you are a student, you can also use Dreamspark to get a lot of Microsoft Software for free (don't know if Office is a part of it though). Another method is to get it through an IEEE student membership (however, I'm still working on the details of getting it). As the foundations crumble beneath the Microsoft monopoly, Windows and Office are becoming less relevant. Now, in a last-ditch effort to survive, Microsoft turns to *renting* its crapware? No thank you, I'll stick with Debian and LibreOffice. Brendon (& Jacki), you two are completely in the right. Go Debian & LibreOffice. Still prefer Open office or Libre. Microsoft has always taken good care of its younger customers by providing them with huge discounts and freebies. This move is absolutely awesome and I hope more and more universities take part in this. If you’re lucky enough to be enrolled in one of the eligible Universities, you should check out MS Office 2013 guide to to be able to fully utilize the productivity suite. Very good. Im getting it free on my Windows 8 tablet also!